One of the buzzwords in movement and posture-based therapies these days is the 'core.' The exact structures that make up this deep stabilizing region of the body vary depending on the system being studied, but there are some common themes that exist. The muscles most frequently discussed as 'core muscles' are the deepest of the abdominal muscles. 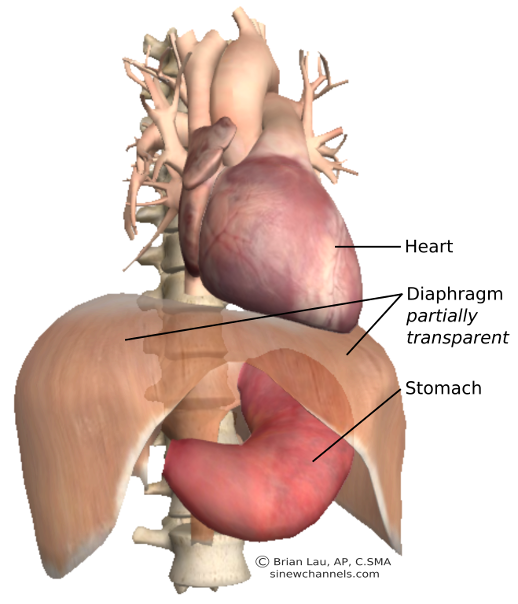 the transverse abdominis; the deep paraspinal muscle group, the multifidi; the pelvic floor muscles; and the diaphragm. These muscles coordinate to stabilize the low spine and pelvis before movement of the legs and arms occurs. 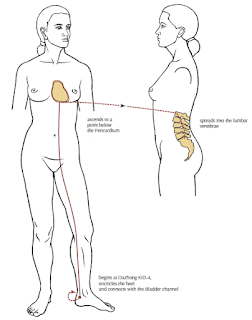 This stabilization prevents degeneration of the spinal and pelvic joints. 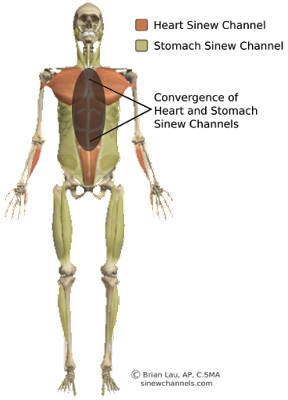 These muscles also work together to align the pelvis and ribcage and properly regulate the position of the spine. 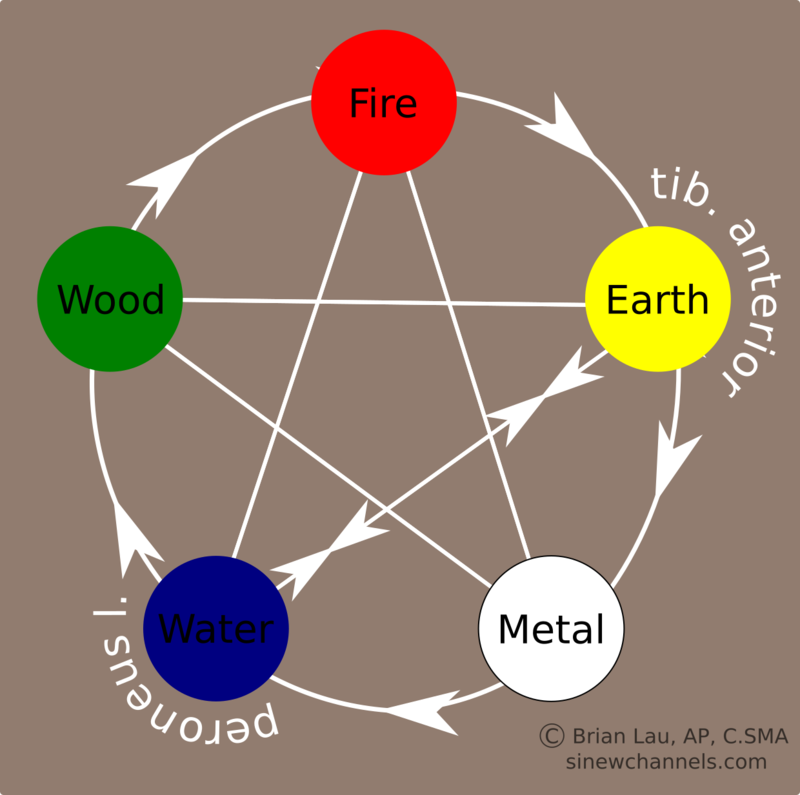 Is there any allusion to these structures in Chinese channel theory? Many channels can be mentioned in this context, notably the extraordinary vessels such as the Daimai, Ren, Chong, and Du. However, it is the Kidney channel that links these structures and can serve as a model to describe this region in TCM terms. 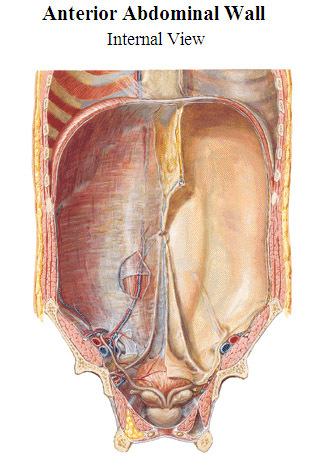 To begin with, the Kidney sinew channel traverses the posteromedial thigh, the pelvic floor and the spine. I interpret this sinew channel as including the adductor magnus and semimebranosus, which have connections into the pelvic floor muscles (such as the levator ani and obturator internus), which in turn connect to the anterior longitudinal ligament of the spine. The Kidney sinew channel includes some of the stabilizing muscles commonly associated with the core, specifically the pelvic floor. ascends along with the Kidney primary channel from Dazhong KID-4 to a point below the Pericardium where it travels posteriorly to and spreads into the lumbar vertebrae. 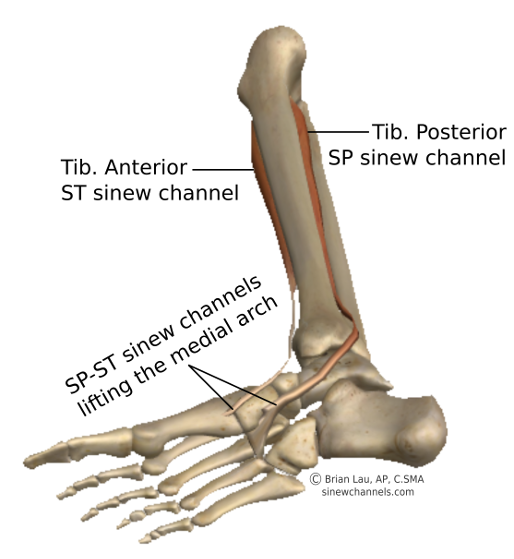 to the central tendon on the superior surface. Let's break this down and explore the anatomical structures. This secondary channel ascends along the Kidney primary channel. This would include the primary channel abdominal points from KID-11 to KID-22. This then connects to 'a point below the Pericardium.' All of this can be interpreted to include the transverse abdominis. The fascia of this muscle (especially the transversalis fascia which is posterior to the muscle and anterior to the parietal peritoneum) does link with the diaphragm, and the pericardium of the heart attaches to the central tendon of the diaphragm (Fig. 2). 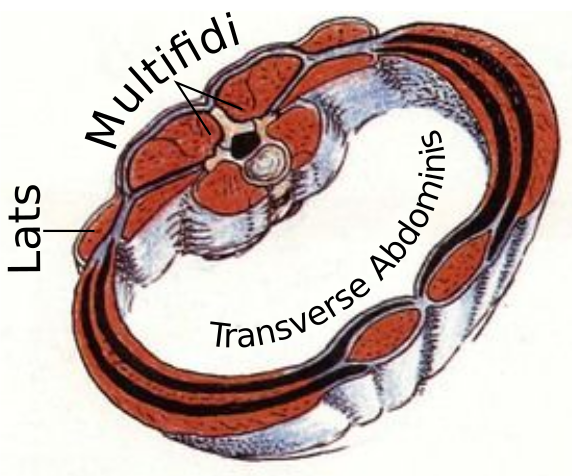 So, there is a continuous plane running up the transverse abdominis to the central tendon just below the Pericardium. This channel then travels posteriorly to and spreads into the lumbar vertebrae. Like many of the Yin luo channels, this channel includes a group of structures which would be on the trajectory of its Yang pair, but at a deeper region of the body. 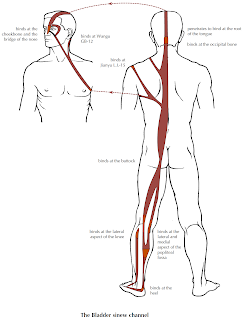 In this case, this would be the lumbar multifidi muscles (Fig. 3). I believe the Kidney Luo-connecting channel describes a functional relationship between the transverse abdominis, the lumbar multifidi, the diaphragm and the pelvic floor. These muscles function together to create core support to lift and stabilize the spine. 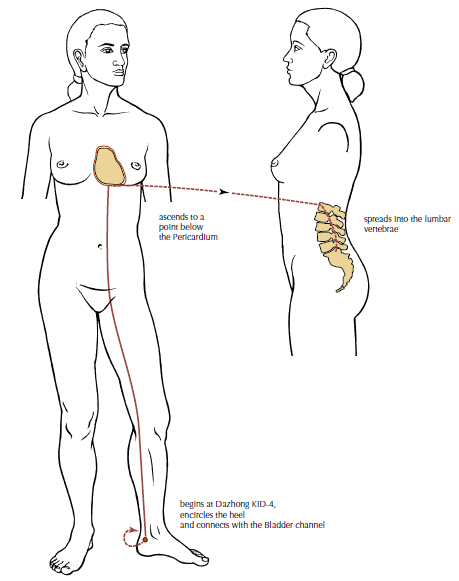 When they are not working well together, there is a collapse that can be seen with a Kidney deficient posture, which overstresses the lumbar spine and contributes to degeneration (See images here, especially Kidney Qi and Jing deficiency). Besides this, when they are not stabilizing the spine and pelvis during activity, there is an increase in wear and tear of these joints. Furthermore, when they are not performing their job adequately, there would be signs and symptoms included in the indications for KID-4, notably, urinary and bowel issues (these muscles are essential to for the pushing type movements necessary for these actions); respiratory issues (tone in these structures regulates intra-abdominal pressure and influences respiration); and lumbar pain and stiffness. You can work this important region with taiji and qigong exercises. In my own practice, I have been more aware how the timing of these gentle moves facilitates an expansion and contraction of these regions, which both improves tone and elasticity. 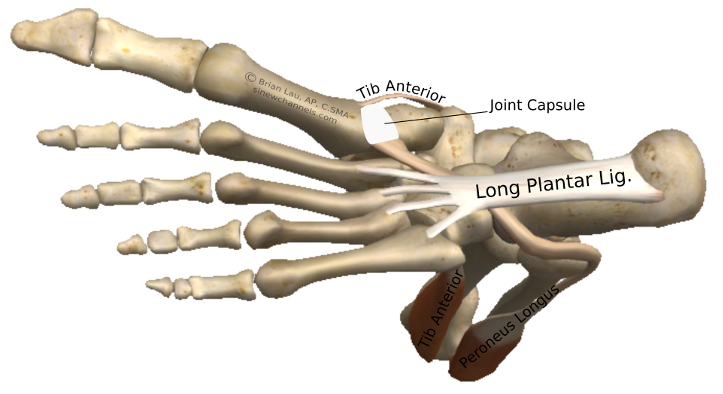 But as acupuncturists, we can also wake up this region with direct needling of motor points of these important structures in addition to using distal points such as KID-4. We can also reduce tension in the related Urinary Bladder sinew channel. 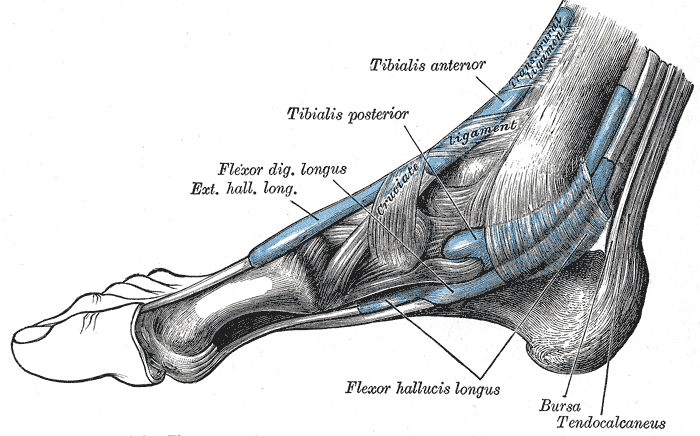 When deep stabilization of the spine and pelvis is inadequately supported from the muscles associated with the Kidney network, more superficial stabilization occurs, notably from the latissimus dorsi (BL sinew channel) which blends in with the superficial layer of the thoracolumbar fascia (Fig. 4). 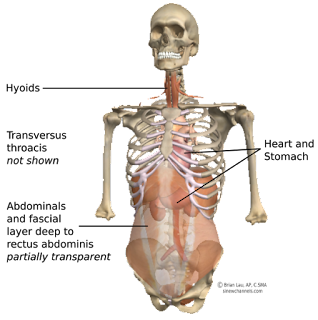 The thoracolumbar fascia then becomes overly dense and rigid. Reducing tension here can help increase flexibility of the lumbar spine and pelvis and can then allow for adequate training of these deeper Yin muscle counterparts. Fig. 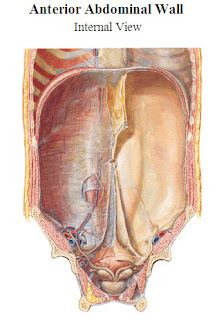 4: Cross section at lumbar region. What is it about SI 3 (Houxi), a point along the Small Intestine channel, that makes it the master point for the Du Mai? I feel that the specific anatomy associated with the Small Intestine sinew channel, especially at the upper cervical region, helps give insight. The levator scapula, in particular, helps link the Small Intestine sinew channel to the Du Mai. 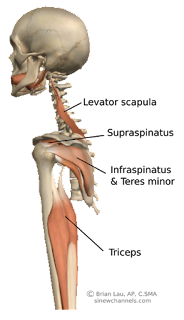 This muscle attaches to the posterior tubercles of C1-C4. From these attachments, there exist many fascial connections to the ligamentous structures of the superior vertebral column. These structures include the joint capsules, transverse ligament, and the midline ligaments (supraspinous, infraspinous, and posterior longitudinal ligament). 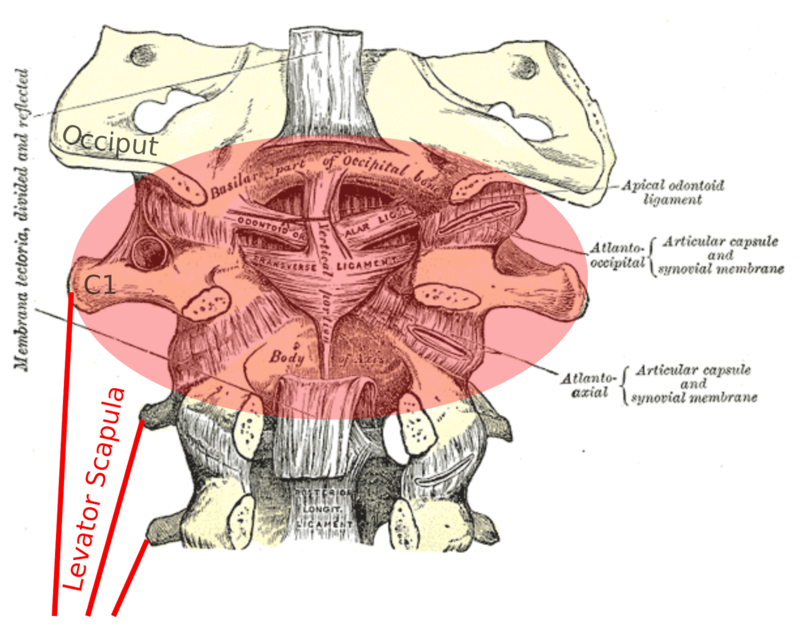 Even tone of the levator scapula at these attachments helps produce balance at the upper reaches of the vertebral column, thus linking the SI channel network to the Du Mai. 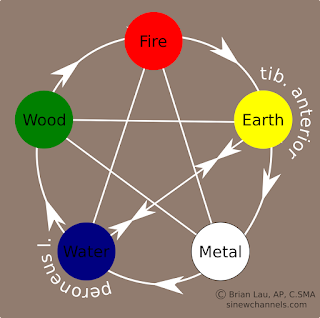 SI-3 is the Shu-stream point of the Small Intestine channel and "Augment the qi and warm the yang, and transform dampness". These actions would be useful when there is degeneration and inflammation of the ligaments of the spine. 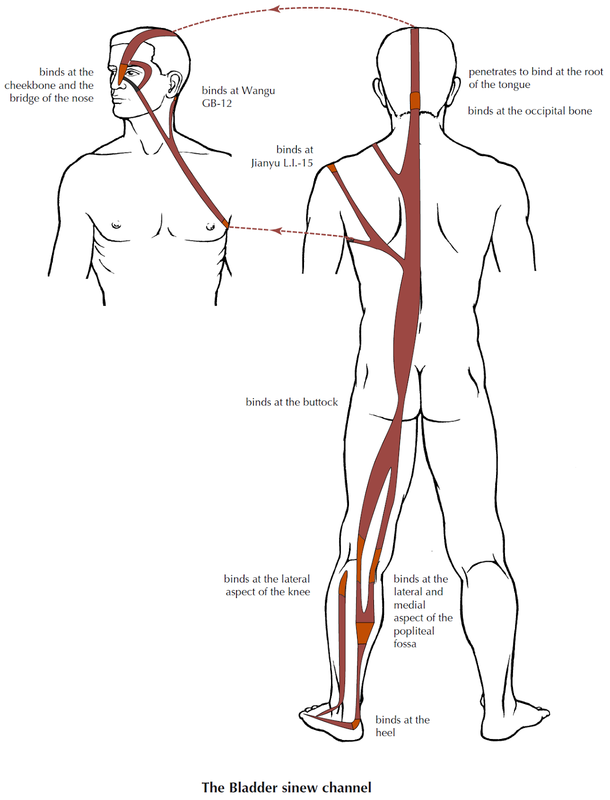 Adding BL-62 (Shenmai), the master point of the Yang Qiao, also addresses the suboccipital muscles, which are also integral to balance along the upper the spine. When these structures are out of balance, fixation of the atlanto-occipital joint can occur. 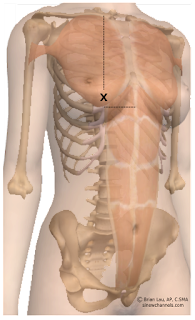 This can have a local effect at the occiptal region, and can have effects further away, especially at the lumbar spine. In SMAC (Sports Medicine Acupuncture Certification) we teach a protocol to address this which was developed by program founder Matt Callison. Assessment of this is beyond the scope of this post, but treatment involves specific needling techniques at BL-10 and GB-20 to address the short and fibrotic (excess) side and to address the more lengthened (deficient) side. This is combined with the extraordinary vessel point pair SI-3/BL-62. The treatment also includes mobilization of the atlanto-occiptal joint to return proper function.